Recycled polyester – Fully functional. Duly delightful. Sustainability and environmental protection are vitally important to us in the manufacturing of functional apparel, so we try hard to use recycled materials whenever we can. This allows us to offer high-quality products that feature eco-friendly manufacturing. 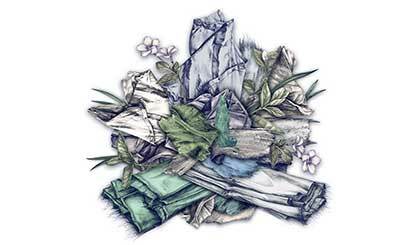 Recycling polyester is a way to use surplus materials from polyester manufacturing to make a new, fine polyester fiber. VAUDE uses this fiber to make backpacks, outdoor jackets and other functional products. By choosing recycled polyester products, you can make a contribution to greater sustainability and resource conservation. Conserving resources and reducing landfill waste – this principle is a priority for us when we’re developing new production processes. 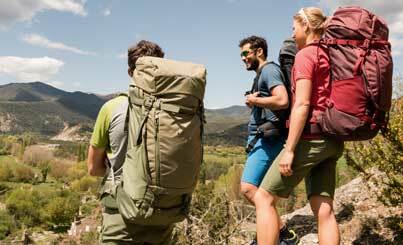 Many post-consumer products can be recycled and even offer additional benefits for your outdoor gear. Recycling polyester is especially important for us because polyester is one of the most widely used materials when making functional apparel. High-quality polyester fiber is fast drying and prized for its light weight. 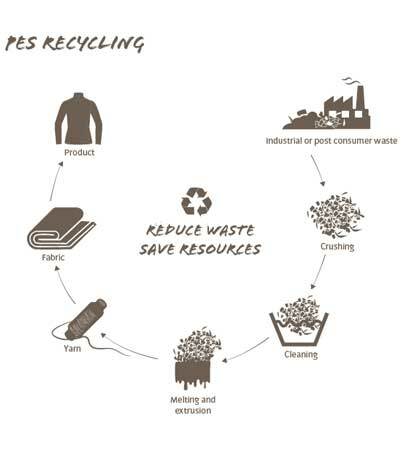 From an ecological point of view, recycled polyester really makes sense. Surplus materials from the industry usually end up in the landfill and place an unnecessary burden on the environment. One more reason to rely on recycled polyester for production. Polyester production inevitably results in remnant materials and most producers don’t have any use for these. At VAUDE, these remnant materials are recycled together with PET bottles and used in a way that makes ecological good sense. First, the raw materials are cleaned and melted down. Then this is used to create a fine polyester fiber that has the same properties as newly produced polyester. By recycling polyester, we can make a longterm contribution to reducing the huge amounts of plastic that is wasted. At the same time, recycling reduces our energy and CO2 emissions by half. By recycling polyester, we can avoid using new fossil resources like crude oil. VAUDE offers a wide range of outdoor products manufactured using recycled polyester. The bags and apparel that we make with this process provide maximum comfort and functionality without placing an unnecessary burden on the environment. You can make your own contribution to reducing landfill waste by consciously choosing products made from recycled materials.